A minimum of 5 entries must be received by 6:59pm on the night of a regular club meeting in order for a competition to be held. A minimum of 3 judges must be available. The number of accepted entries may be capped based on judges request. First-come, first-served. Look for the table of judges wearing gold lanyards. Each active member may enter one 12-ounce bottle of beer per competition. The brewer must be present to enter. The bottle should be free of labels or identifying marks. Complete an entry form by writing your name and the competition date on the front. Write the appropriate BJCP style category and sub-category on the back. Attach the entry form to your bottle by taping one end to the cap with your name NOT visible. Judges will complete a checklist-style scoresheet for each entry and provide an overall score. The highest scoring beer wins first place. The second highest scoring beer takes second place. Awards will [usually] be presented between 8:00 and 9:00pm. All entrants will receive their scoresheets at the end of the competition. Most months will allow any permitted category/sub-category to be entered, and will be awarded in a best-of-show format. See the list at the bottom of this page for accepted categories. Four times a year, only specific categories will be permitted, and all entries from each category will be judged against each other with one winner chosen from each. Winners will have their name, beer, and place temporarily written on the PALE trophy and permanently recorded on the PALE website and on the PALE Facebook page. Winners may choose to have their photo taken with the trophy to commemorate their achievement. Winners will be asked to provide a brief description of their beer, the brewing process, and the aging or bottling process if relevant. 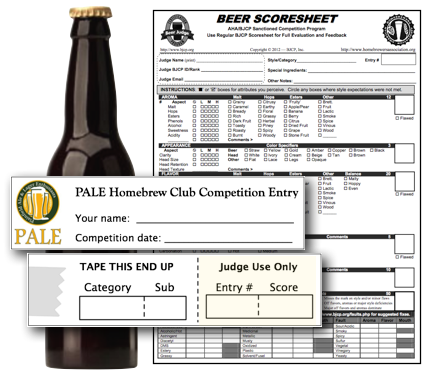 The top placing winner in each competition will receive a certificate redeemable for the cost of one entry fee in a BJCP sanctioned homebrew competition. Certificates expire one year from issue date. Contact the PALE Competition Chair, Darien Kruss, by email darien@kruss[dot]com.